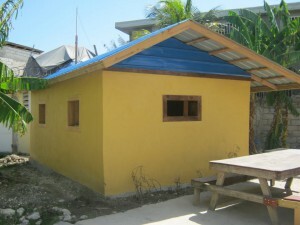 Home » Uncategorized » Haiti Ubuntu-Blox House is Finished! Haiti Ubuntu-Blox House is Finished! Congratulations to Harvey Lacey, Haiti Communitere, and the Haitian volunteers who built the first Ubuntu-Blox home in Haiti. The house has personality as you can see and is 240 a=square feet – 12 feet by 20 feet. Harvey plans to go back to Haiti this summer to begin building homes in one of the poorest parts of Haiti. This is a great accomplishment for the people of Haiti. This home is safe and something they built and made with their hearts and souls. Congrats all! And thank you Haiti Communitere for supporting the training and believing in Harvey.